You'll have to excuse the quality of the picture, it is the only one I could find for this post on short notice. I made Shaun's favorite stir fry recipe for dinner last night and he mentioned how much he likes the recipe and how great the leftovers are for bentos the next day. This was followed by "You should add a post on that." Well, I can definitely add the post, but there were no leftovers to make said bento, so I'm recycling a really old picture because it is a meal worth sharing. This would be a larger 2-sided Lock & Lock box. It's great in that each side lifts out separately so you can have a food that needs to be warmed and still have a food that needs to be cold or room temperature. 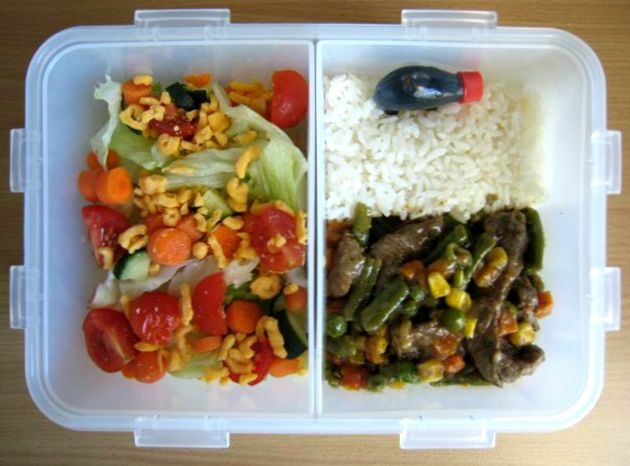 In this case, he has a salad of sorts, steamed rice, a beef stir fry, and a little pig bottle for extra soy sauce. Mix the 4 ingredients together very very well. Add veggies and well-mixed sauce and stir-fry until veggies are desired texture. That's it, so easy, but very very good and great for a bento leftover if you have microwave access. Love your blog and am your newest follower. Hope to see you at one or all of my blogs! If you want I will put your button on all my blogs, just grab mine and leave a comment and I will grab your back! I look forward to reading you awesome blog! I always thought stir fry uses Chinese ingredients but you've not introduced me to a whole new way to tantalize our taste buds! :D Thanks!